Several celebs have been trolled by people on the internet who are convinced they are not really pregnant but faking it while a surrogate really carries their child. Beyonce, Danielle Jonas, Meghan Markle and Kenya Moore have had to dodge fake pregnancy rumors during and after delivery. Bravo TV star of Shahs of Sunset Mercedes “MJ” Javid is the latest. The 46-year old is pregnant with her first child, a son, after undergoing in vitro fertilization. The real estate biz owner has been on bedrest for the most part of her later stages of pregnancy following a few complications but despite giving fans glimpses of her baby bump on her Instagram page, she is still routinely harassed by many to show a mirror selfie of it while standing up. The maternity shoot which is featured exclusively in PEOPLE magazine today should do the trick to get them off her back, according to a recent post. She addressed the body shaming and fake pregnancy accusations in the magazine. You’d think that would be the end of it. Nope! The photo garnered a lot of attention but did not stop folks in the comment section a.k.a. the peanut gallery from criticizing the photo edits, and some still said it wasn’t her real belly. So..she felt the need to follow up with a non-glam bump photo for the haters. “And a no filter, no make up, no suntan, at home baby bump selfie, to shut down all the haters who have a problem with a woman getting out of bed after 3 and a half months of bed rest to get a little hair and make up for her maternity photos. 😘” she captioned a selfie photo in sweats at home. She previously addressed the hounding on an Instagram Live, ask me anything session with fans. You cannot please people so it’s better off not trying. I don’t know how celebs do it being constantly judged and picked apart. Wait until that baby comes. 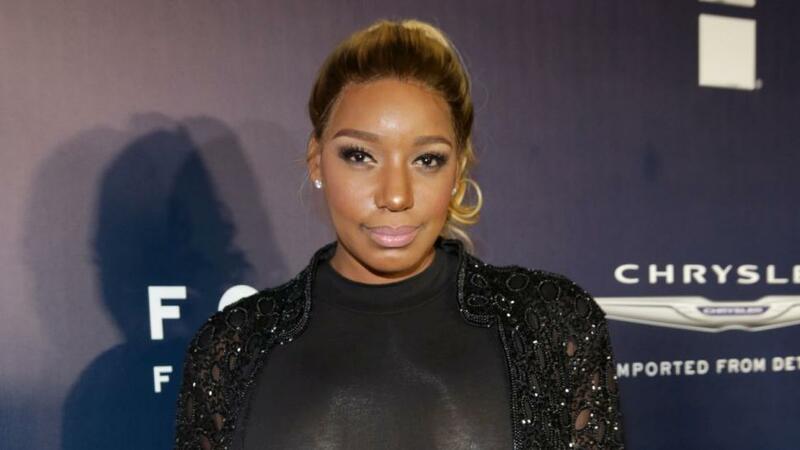 She can see how folks are tearing into new moms like Chrissy Teigen, Kenya Moore, Gabrielle Union and now Porsha Williams to get a taste at the levels of unsolicited advice and shaming in store. 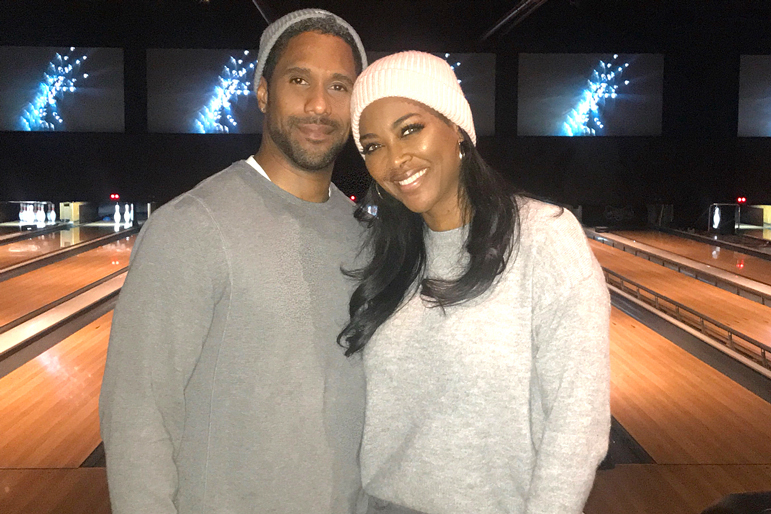 Congratulations to Real Housewives of Atlanta reality star Kenya Moore and her husband restaurateur Marc Daly who welcomed their first child, a daughter, together tonight, Sunday, November 4, PEOPLE magazine reported. The couple, married since June 2017, named their new arrival Brooklyn Doris Daly. “Brooklyn because that’s where we met and fell in love, and Doris after my grandmother who passed away last year and who raised me,” Moore told People of the name’s significance. According to the mag, “Brooklyn is very alert and active” and was born weighing at 5 lbs. and 12 oz. Hours before welcoming her baby, Moore took to Instagram to give fans an update from the hospital. “If you want to make God laugh have a plan… won’t be long now. Pray for us 🙏🏾 #babydaly #weloveyou #prayers,” Moore captioned her photo where she is seen smiling while lying in a hospital bed. The former Miss USA conceived through in vitro fertilization and gave birth via emergency cesarean section after she shared last week on Oct. 27 that she had tested positive for preeclampsia — a pregnancy complication. She shared a photo of her swollen feet. The Mayo Clinic defines preeclampsia as a condition that usually evelops suddenly in women who previously had normal blood pressure after the 20-week pregnancy mark, and if not treated, preeclampsia can have fatal consequences. Once the mom delivers, the condition ends. 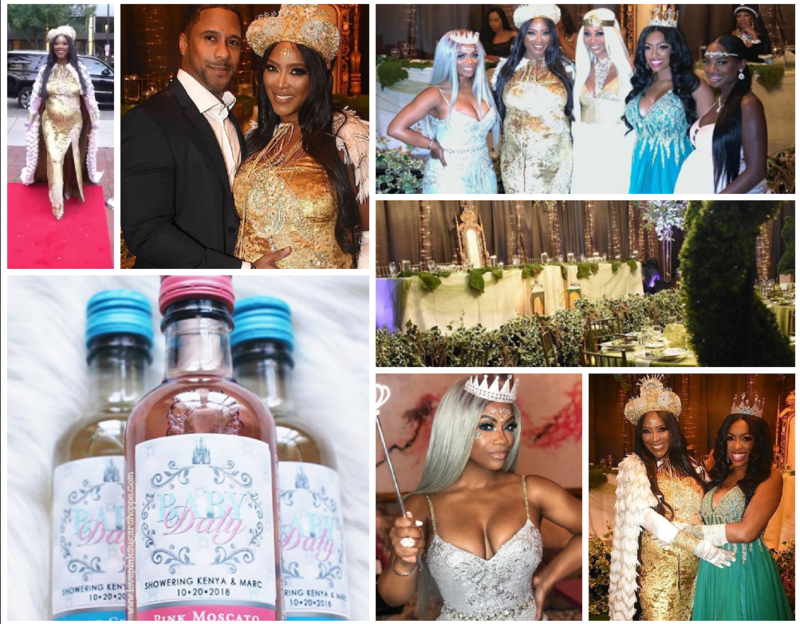 Last weekend, Real Housewives of Atlanta alum Kenya Moore and her husband Marc Daly celebrated the impending birth of their first child together at a Wrinkle In Time -theme baby shower in Atlanta where guests were asked to dressed in elaborate costumes to reflect the theme similar to the Met Gala. The seated plated event was held at the Historic Academy of Medicine building at George Tech University, a venue used often for lavish banquets, weddings and other formal events. It was held in an intimate sized ornately decorated room, draped in lighted organza, green carpet, golden thrones and everything needed to resemble an enchanted forest. Guests of the October 20th event included family, friends and former castmates Porsha Williams, Kandi Burrus, Cynthia Bailey, and Claudia Jordan along with “Real Housewives of Potomac” star Gizelle Bryant, Married to Medicine stars Toya Bush-Harris and Dr. Heavenly Kimes among others. When the time was right, Moore Daly entered the red-carpet event after emerging from a luxury black SUV and joined her already gathered guests to an awaiting head table that included her aunt, hubby and several relatives. At one point, Moore Daly and Williams and Morton talked about not being able to breathe while preggers. Cute. The Dalys took a spin off of a very popular theme among celebs: Royal. 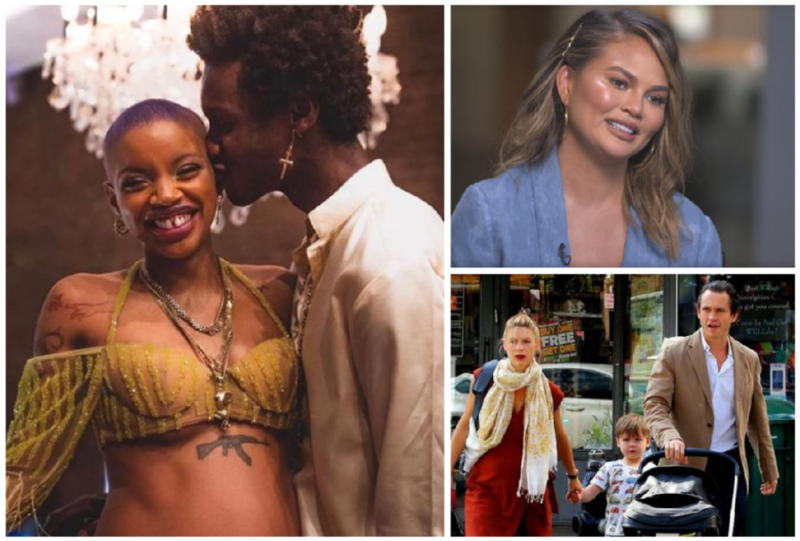 It is one previously in the past including, Lil Kim, Jojo Simmons, Chrissy Teigen and John Legend, Creed frontman Scott Stapp and his wife Jaclyn, and even Moore Daly’s former co-star Eva Marcille earlier this month in March. Guests took home custom a box of favors featuring personalized chocolate bars, Tic Tacs, wine and sanitation wipes. 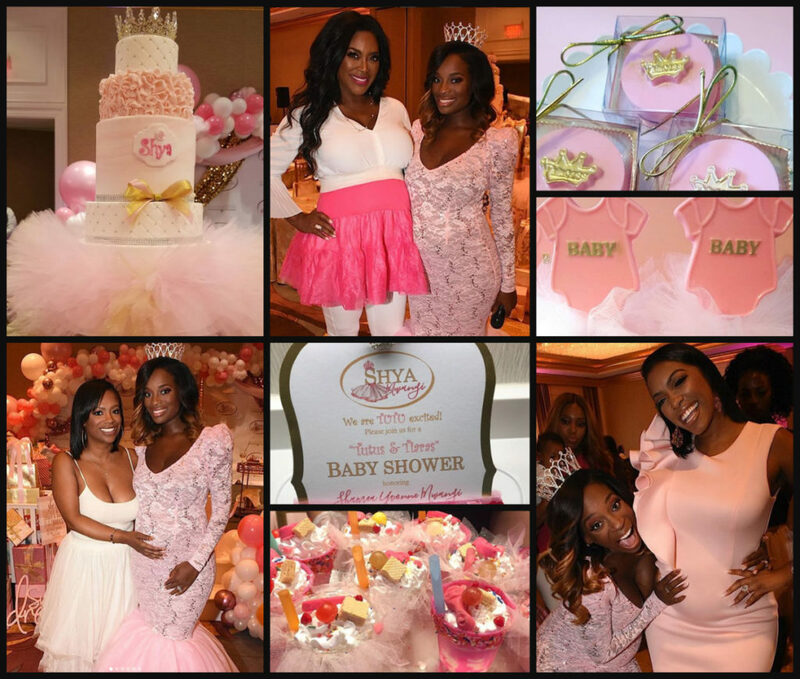 Bravo TV’s Real Housewives of Atlanta star Shamea Morton Mwangi celebrated the impending birth of her daughter at the Four Seasons Atlanta Hotel this weekend during a Tutus and Tiara-themed baby shower. 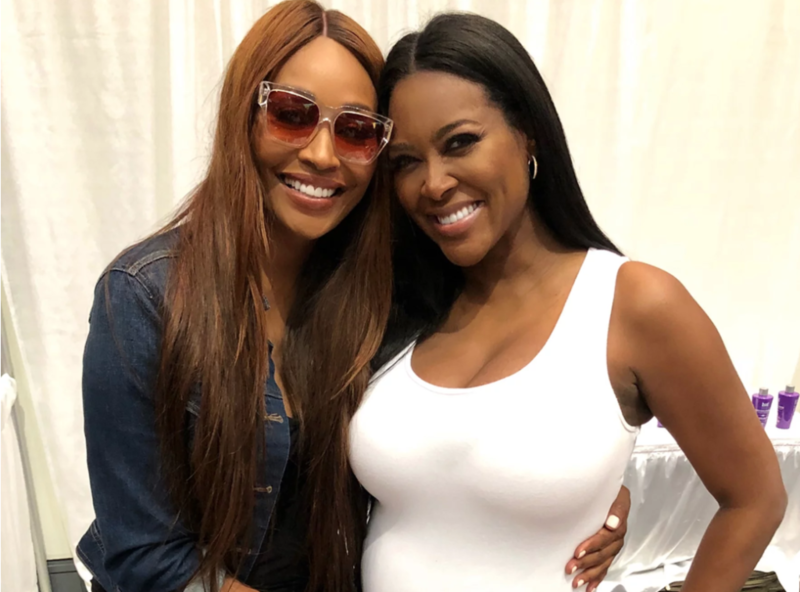 Several of the celebrity guests including her RHOA castmates (current and former) came out including our Bellyitch Bumpwatch alum Kandi Burruss, current moms-to-be Porsha Williams and Kenya Moore, who was outfitted in a pink tutu as well, and Sheree Whitfield. Guests were greeted with personalized napkins and ornately decorated table settings and gold tulle lined chairs. They also got to capture the memory of the lavish event by posinf in front of a pink flower wall. And the parents took home scores of gifts! Fun! Real Housewives of Atlanta alum, Kenya Moore Daly continues to be dogged with and by rumors that she is faking her pregnancy and it seems no matter how many bare bump photos or pics of her cast mates cradling her belly she posts, there are always people in her comments expressing disbelief that the 47-year old former Miss USA is really expecting her first child. 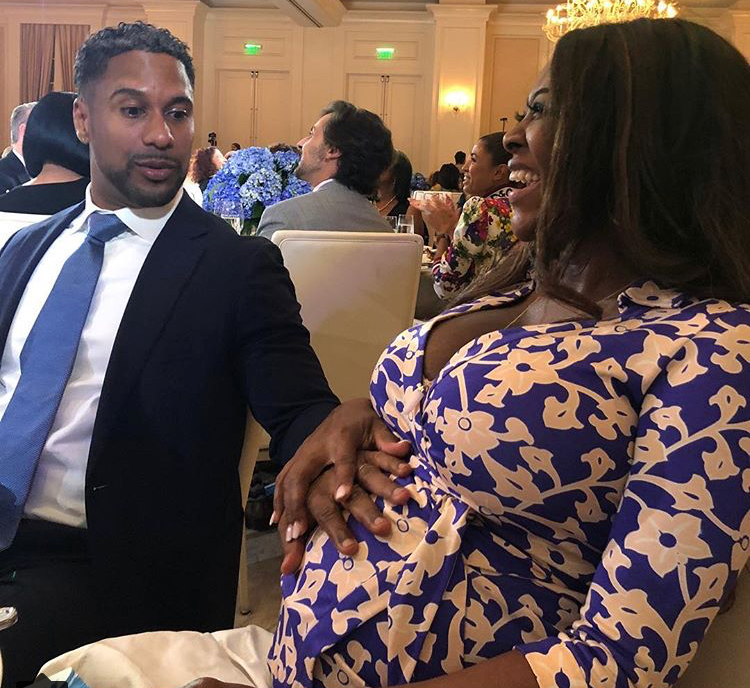 Even recently, when she posted a cute Instagram photo of her hubby restauranteur Marc Daly feeling her baby kicks, she still had haters decrying the authenticity of the moment. Ugh! It is amazing to me. She is not the only one. Beyonce and Danielle Jonas both were trolled all Pregnancy and beyond when they each had their first kid. Kim Kardashian was too and was BravoTV‘s Real Housewives of Beverly Hills former cast member Adrienne Maloof but way after the fact. One season of the hit series focused on a rumor that Maloof had used a surrogate to birth her children so as not to “ruin” her body, but lied about actually being pregnant and going through labor and delivery to save face and not come off as being a superficial and vain person. Meanwhile, who aren’t accused of faking their pregnancy? Celeb women who barely look pregnant even at 5-months along like Remy Ma or who undergo an entire 40 weeks pregnant undetected and just crop up with a set of twins like Anna Kournikiva did! It is quite interesting to me who gets the suspect treatment and who escapes it.Over 9 million people have enjoyed Bellyitch's Award-winning Celeb "bumpwatch" pregnancy and parenting blog. Trying to Conceive? Download our FREE Fertility 100 ebook. Hunting for Top Maternity or Kids Brands? Our Bellyitch 100 is the free resource for you. Baby Shower Shopping? Check out out Top Picks on Amazon or our Gift Guides. 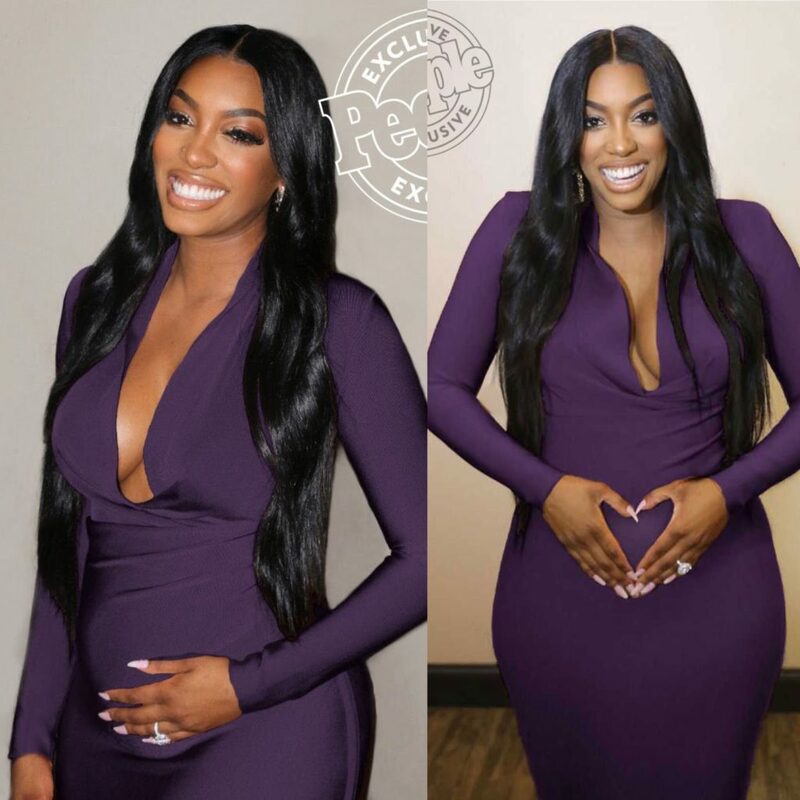 Congratulations to Real Housewives of Atlanta star Porsha Williams who is expecting her first child with boyfriend Dennis McKinley. The news came with trepidation because the stage actress suffered a previous miscarriage six years ago. “When I found out I was pregnant, I was excited [but] I had mixed feelings. The other feeling that I had beside excitement was fear,” the Real Housewives of Atlanta star, who suffered a miscarriage six years ago, told PEOPLE in an interview for the newest issue, out Friday. Photo: PEOPLEOver 9 million people have enjoyed Bellyitch's Award-winning Celeb "bumpwatch" pregnancy and parenting blog. Trying to Conceive? Download our FREE Fertility 100 ebook. Hunting for Top Maternity or Kids Brands? Our Bellyitch 100 is the free resource for you. Baby Shower Shopping? Check out out Top Picks on Amazon or our Gift Guides. Lip Sync Battle host and author Chrissy Teigen opened up about Postpartum depression (CBS News)Over 9 million people have enjoyed Bellyitch's Award-winning Celeb "bumpwatch" pregnancy and parenting blog. Trying to Conceive? Download our FREE Fertility 100 ebook. Hunting for Top Maternity or Kids Brands? Our Bellyitch 100 is the free resource for you. Baby Shower Shopping? Check out out Top Picks on Amazon or our Gift Guides. Moore and Daly are expecting their first child together. The 47-year old announced the news during the reunion show and is due this winter. Since then, she has been plagued with verbal assaults by online followers who have consistently accused the star of faking her bump.Over 9 million people have enjoyed Bellyitch's Award-winning Celeb "bumpwatch" pregnancy and parenting blog. Trying to Conceive? Download our FREE Fertility 100 ebook. Hunting for Top Maternity or Kids Brands? Our Bellyitch 100 is the free resource for you. Baby Shower Shopping? Check out out Top Picks on Amazon or our Gift Guides. Last week was a busy one for some of Bravo TV‘s expecting Real Housewives. 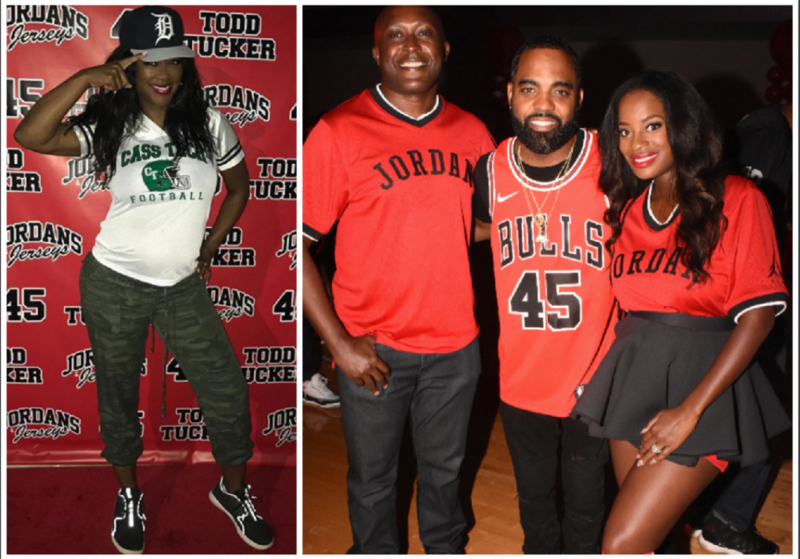 Real Housewives of Atlanta star Shamea Morton and Kenya Moore donned their best sports Jerseys and Jordan sneakers to attend Todd Tucker’s Jordans and Jerseys birthday party in Atlanta. Earlier in the week, the former Miss USA and another Atlanta power couple hit up fellow RHOA castmember Kandi Burruss‘ Old Lady Gang (“OLG”) restaurant she owns with her husband. Real Housewives of Potomac star Monique Samuels sported a tiny bump in a glamorous blush sequined gown while attending and taping that franchise’s reunion show which was spent “reading” a lot of her fellow cast members according to her caption. 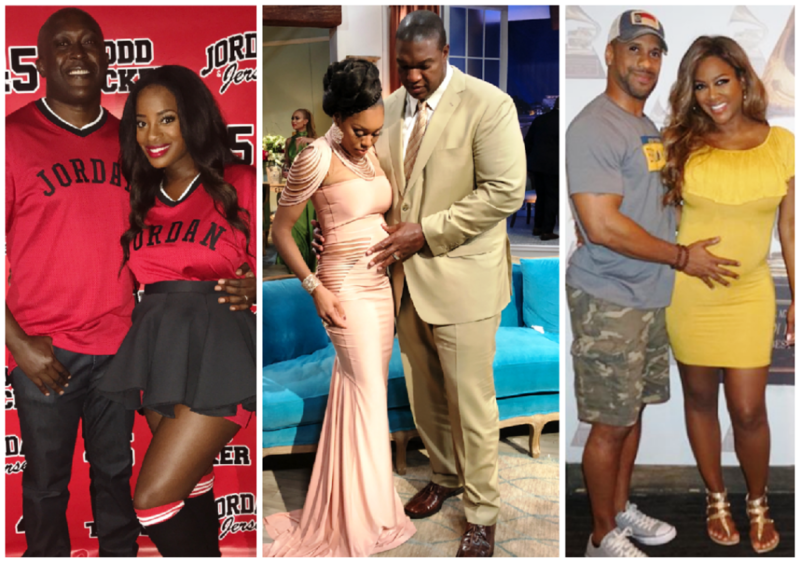 “Baby daddy just checking on the bump after all the reading I had to do,” the Not for Lazy Moms lifestyle blogger captioned a pic of her husband Chris Samuels cradling his wife’s bump mid taping.